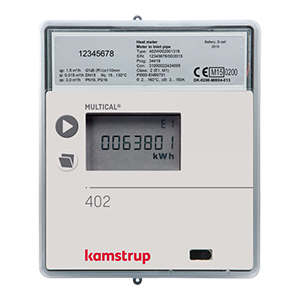 The Multical 402 is a compact ultrasonic energy meter which through its supreme measuring accuracy is able to register exact consumption figures. The meter is maintenance-free and has a long lifetime which guarantees minimum yearly operating costs. The Multical 402 is used for heat, cooling and combined heat/cooling measurement in all water-based systems with temperatures from 2 to 160°C. The energy meter has been developed for measurement of energy consumption in family and multiple occupancy housing, housing associations, blocks of flats and small industrial units. The MULTICAL 402 is a compact ultrasonic energy meter, is has been developed for the measurement of energy consumption in family and multiple occupancy housing, housing associations, blocks of flats and small industrial units.